This post is now out of date. Please check here for the latest information. If you can’t get online to do it digitally there are special support centres around the country to help you out. Call 03000 200 301 for more information on them. The way you claim your Basic Payment Scheme money, and the rules you need to meet, have changed. This means lots of new information to gather, so we advise that you make a start now so that you have plenty of time to complete your claim. But, once all the information is in, subsequent years will be a lot quicker. The registration section of the service is open now. Agents are already registering so they can start helping clients with their claim. We’re also contacting everyone who has told us they may need help and finding out how best to assist them, and working with partners to reach people who might need more information or assistance in making their claim. We’re releasing the service gradually so there’s not a ‘big bang’ launch and so we can gather feedback and improve the service as we go. That means some elements will be available from January onwards but you won’t be able to make a complete claim until April. However, since there is quite a lot of information to be gathered we would recommend you make an early start if you can. We’ll tell you about all the changes and improvements on this blog so keep an eye here or follow us on Twitter @ruralpay for updates. Once registered, you can check back in to your account for any updates too. You should register now as there will be lots to do. You or your agent will be able to register your personal and business details and start checking your maps and land details. You can also appoint an agent to act on your behalf and set up permissions. This is when the system will start to display things we think you need to check and you’ll be able to react and amend them. This includes adding information on land cover and usage. If you have a lot of land parcels, or a lot of changes, then you should start telling us about them on the Rural Payments service as soon as you can. We will digitise your land information, and present it back to you to check it is OK.
You’ll be able to start making your 2015 claim. If you’ve already registered, checked and amended your maps and land details this shouldn’t take very long. From March you can confirm entitlements and eligibility, and can complete and submit your 2015 claims up until the 15th May. Up until 15th May 2015, you can complete and submit your claim. You can continue to submit your claim up to the 9th June but will be subject to penalties. You can make amendments to submitted claims up until 1st June without penalties. Amendments after the 1st of June, and up until 9 June, would usually be subject to penalties. 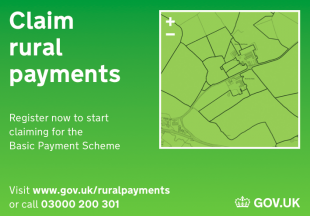 If you want to get started head to www.gov.uk/rural-payments and get registered with the new service, or call 03000 200 301. For updates: you can follow the blog (https://ruralpayments.blog.gov.uk/) follow @ruralpay on Twitter, or for any other help you can call 03000 200 301. Once registered, you can check back in to your account for any updates too. Your links to 'register now' do not work! When will we be able to transfer Entitlements? The hyperlink still doesn't work! Please let me know which hyperlink you are having trouble with and we will look into it. Your 'register now' does not work. I have a SBI number which I have input and then get a message saying that Rural Payments Agency have no record of it! You can call the RPA direct on 03000 200 301 and they will assist you with your SBI number. The helpline is open Monday to Friday, 8.30am to 5pm. Is it correct that the Registration Code is now only valid for two hours, being reduced from 12? If the answer is yes the person who made the decision should be sacked! A number of my clients do not have email addresses or have been using BTConnect. As a result it has been necessary to email the registration code to me so that I can complete the registration on my computer when I return the office later in the day. If the registration code is only valid for 2 hours to visit more than one client in a day and get back to the office in time to complete the registration before the code becomes void will be impossible. For some of my clients it takes more than two hours to drive from their farm to my office. Hello, thanks for your query. The registration code will continue to be valid for 12 hours. The Telephone Registration Process is working pretty well and have most clients on the system. I am now interested to know about the nature of the application process itself....... is the submission itself going to be the maps themselves or will it be a claim form? If it is the latter will the information entered on the field parcels automatically transpose into a submission form. If so will it be possible to overwrite that information/further split fields before submitting using my own measurements from other (probably preferred and pre-done) mapping systems? Finally, like many other agents, I will have c80 applications to submit and I foresee some pretty stressed agents out there. In other words please get the functionality in place asap. Hello, good to know that you have most of your clients registered and that you are already doing some preparatory work. The claim itself is not a form; as you check your details on the service you are compiling the information for your claim. You can check and update land details before you submit the claim. We are releasing new features of the service next month; please see our most recent blog posts for updates about which new features will be available when. Re: transposing mapping information into the claim. As I understand it any changes to mapping has to be verified by ???? before the claim information is amended/revised. This additional step will yet again add to a very lengthy process when checking in excess of 500 field parcels. I've yet to get on the system to see what information RPA currently hold as the system is always unavailable and I cannot link to a business. The service is currently available but as we are making updates to it this week, it may be slower than usual. You need to register and then once on the service, you’ll see if the Rural Payments Agency (RPA) has already linked you to any businesses. If not, you need the key contact for that business to give you permission to access it (“link” you to it), using the customer reference number you’ll receive when you register. If you should be the key contact, please call the RPA; 03000 200 301. You are right that any changes you propose to the land parcels for a business on screen need to be verified by the RPA to help ensure your claim is accurate. Im trying to add ineligible features to my fields, but when I press the Submit and Return button it keep saying proposal failed, and I have checked that it all adds up to the actual field size? I have been alerted by the Tenants Farmers association that the old SFP on line system will be removed at the end of March- surely this is very short sighted given users will be wanting to compare data in order to ensure the BPS system is correct- why not wait until after the 2015 submission period is complete? Sorry to hear you’re having problems with registration. Please call the RPA helpline on 03000 200 301 and they will assist you. have tried to check maps and found it very difficult and slow to draw around the map as it requires you to do. having clicked around the area required, how to you click off the map? It just doesn't seem to work like a bespoke mapping programme. Where are the help features? How accurate are we supposed to be? when you authorise someone as an agent you have to go to the highest level for the agent to submit the claim, this also says they will recieve all post. Why can't an agent submit the claim but the claimant recieve the post? My postman is still recovering from delivering 50 odd copies of instructions on how to claim for SPS! Thanks for this feedback, we’ll look into this issue with permissions and see if improvements can be made. Registered three weeks ago, but still can't get the business details to load. Your help desk say they can't get my holding to load either. They say it is a fault in the system. We can't check our records until you fix this, and if you keep sending us emails telling us to check them we are gonna get very cross with you. just sayin. Hello, we are aware of this problem and the helpline is looking into your individual circumstances. Apologies for any inconvenience this is causing. I have a couple of parcels of land which are not eligible for claim , when I check my map and the list of parcels , there is an option to delete and then save .is this the correct way to proceed to remove the land from the claim ? thanks. Hello, if you don’t want to include one or more of your land parcels in your BPS claim, you don’t need to remove the parcel completely from your holding. You just need to tell us about the land features and land uses on those parcels and the system will not include them in your claim when the time comes, if the land uses and features you record are ineligible for BPS. If you want to remove them permanently from your holding or ownership, please call 03000 200 301 for further advice at this point. The land is not part of a farmer’s holding if the farmer is a licensee who only has access to graze or mow the land. The land is at the disposal of the licensor, where the licensee only has access to graze or mow the land parcel. Have mapped all my ineligible features, but just wanted to check if I then have to bother mapping the remainder of the field that is eligible, seems a bit pointless, and time consuming? PS - forgot to ask if there is an issue with putting 01/01/2009 as the date of establishment? I have been using this date for features that have been there for years as its the furthest point you can go back, but the system doesn't seem to like it, so have been putting in later dates? every time I use this date is says "proposal Failed", but if I change the date it works?! Hello, you do need to tell us about your land use on your parcels. You must select a land use from the drop-down list, tell us its size and the service will then prompt you to draw the location of the land use(s), if required. You shouldn’t have a problem with your date of establishment, please do try again to enter the correct date and we’ll look into the problem. If you continue to have problems, please call 03000 200 301 for assistance. Thank you for your three recent comments. If you hover your mouse over the aerial photography or Ordnance Survey map view of your land parcels, the field parcel reference number will appear next to your cursor. If the parcel details are correct you can confirm you have checked the parcel. Regarding your query on land parcel sizes being displayed to four decimal places, we are working to resolve this as soon as possible and apologise for any inconvenience caused. We have provided customers with an update on decimal places on our blog page about the service, and will update this when the issue is fixed. https://ruralpayments.blog.gov.uk/latest-updates-on-rural-payments-availability-and-service-performance/ Your feedback is valuable to us and we appreciate you taking the time to provide it; feedback is integral to the way we are developing the service and making improvements to it and we are working on a number of improvements to help our customers check their land parcels for their Basic Payment Scheme claims. Just started to confirm field size information but see the problem with decimal places. Old SPS worked off 2 (probably rounded from 3) but now have 3. This means a requirement for a "land use feature" which of course is wrong. Please confirm when this is going to get fixed as this is a major hold up for us all. Hello, we’ll be updating the service to reduce the number of decimal places required and will update this blog when we do so. I've lost the ability to edit existing features it just says "Something went wrong Please try again later" and the site locks up and I have to log out.... this used to work last week!!! Sorry to hear you are experiencing difficulties, we are aware of the issue you describe and we are working to ensure it is resolved. Please do try again and if you experience the error message, call 03000 200 301 to report it. Here we are, 7th March 2015, BPS deadline 15th May 15 - when, please tell us WHEN will this new BPS system be "up and running"??? It would seem that it gets "taken down" every few days/weekends and then when it's put back up nothing further has been added??? Farmers and agents keep trying to add their details onto the system/transfer entitlements but still the system is not accepting their instructions. I think the time factor nees some very serious consideration ........... This situation is completely unacceptable. We were making technical changes at the weekend and we’ll need to do this again on occasion. We will try to keep any disruption to an absolute minimum. This is all part of us introducing the service gradually to ensure we can fix things and make improvements as we go along, in line with customer feedback. You’ll soon be able to use the service to manage your entitlements; we’ll keep you posted on this blog when that becomes available. Do we have to sign up for the webinar tomorrow? What is the link to login at 10am? Thanks for your question. Unfortunately we don't have any spaces available on the webinar but we will publish the recording on this blog as soon as we can afterwards. Since the last update today the ability to zoom into a field seems to have been reduced to such an extent that I cannot accurately judge where the field boundary line lies in relation to the edge or the centre of a ditch. Are you going to improve the ability to zoom into map features soon? In some of my fields you show up to 5 ditches yet your online map does not show which area relates to which feature. How can I judge whether the area is accurate if I don't know which area applies to each ditch? On the paper maps you used to put a small number against each ditch which was itemised and cross-referenced to the area. Is this likely to appear soon on the online system? The field shading completely covers a OS map feature such as a ditch to the extent that I cannot see if the field boundary line is in the correct place. Is this going to be improved soon? The satelite photo sometimes shows the boundary line in a different position to the OS map feature and sometimes in a different position to the field boundary line. Which one should I believe to be the accurate position? I have two fields that I need to add on my field list. Will the ability to add fields soon be available? Assuming I will soon be able to add a field (land only with no entitlements) where will I be able to add the cropping for this year as the fields will be part of my greening area? I need to delete a field from my application which will be added to another person's return. Do I click trhe box to remove it or do I just leave the box blank to show I have not checked it? Can I send in field alterations from my existing RLR paper maps and let you sort ecerything out? When will we receive full written instructions on how to use the online mapping system? Will a PDF soon be made available as I could be learning how to properly use the system in readiness for when you everything uploaded and working. I would have asked these questions in the webinar but unfortunately, as you have replied above, there are no spaces available. I registered in the beginning of feb with no problems, set up my password and everything all great logged in the other day and all my fields have gone and its says im not linked to any businesses !? I phoned the helpline and the lady said she could see all my land parcels and everything was ok her end and that it could be due to the uploads taking place and to give it a few days and try again, its now been over a week and its still says im not linked to any businesses?!!! Hello, sorry to hear you’re having problems, we would advise that you contact the helpline again for support on 03000 200 301 and they will be able to investigate your circumstances. I have registered one of our clients this morning and due to his cropping being 3 different types the system has asked for the lines to be drawn on the map. The first time I had the dots showing and managed to achieve the correct sizing and the field turned green, the second one gave me a cross and then showed a blue line to which I drew the appropriate area - this has remained outlined in black, no filled colour - what is the difference between these 2 methods of drawing and am I on the correct lines in showing the split crops? Finally our client is growing roses however I could not find this as an option - what coding do you use for roses? Every single parcel and feature showing on all my clients' land is marked 'More information required', yet my colleague who started mapping yesterday did not have this against any of his permanent grassland so he could just confirm and move on. Should more information be required for every single feature/land use? Thanks for your feedback. The service’s mapping tool is not designed for the accurate measurement of features and land uses. Please ensure you have the correct measurements before using the service so you can enter the correct size in the box provided when prompted. You only need to use the mapping tool to indicate the location of the land use or feature; the RPA will then check this information for you and confirm it. Sorry to hog the blog but if you want to have a real laugh have a look at the varying names of differing types of woodland within the land uses and features list published by the RPA on 11th March. Which category should I use for my clients area of trees from amongst the following : Forestry, Woodland Block, Mixed Woodland, Scattered Trees, Trees - Clumps, Woodland Compartment etc etc. Many of these have the same description beside them ...'For BPS land that is ineligible due to the trees on it should be marked as ‘trees – clumps’ or ‘Scattered trees’. Ineligible woodland should be marked as ‘Forestry’ or ‘Commercial woodland’. I also had a small stone quarry on this farm - sensible suggestions from the land use list for this please. A stone quarry might just come under 'Cliffs'!!!!!!!!!!!!!! Cracked it - 'Mineral extraction Site'..........I hope. Not that we have been able to access land details since last friday. When is the system going to be back up and running for us to check our land parcels and map features? We have been trying to do this since Friday last week! We have lost almost another week already. Some of our land parcels which have been part of our SPS claim and IACS claims for 20+ years and are registered to us on the RLR are missing from our list of land parcels on the system. Is the new system incapable of simple migration from SPS online? Are you re-inputting data manually and there are errors? What is going on? Please put accurate information in the updates on the cap reform blog. It states that "Occasionally the service will be briefly interrupted while we make technical changes". It has been unavailable for 5 continous days now to update any land details. The Helpline is not able to give any indication whether this is likely to continue to be the case for hours, days or weeks. With 58 days till the deadline, 5 days as a proportion cannot be described as a 'brief interruption'. Workload cannot be planned and when the service is available again it will be inundated and is unlikely to cope with the volume, if it cannot cope now. With regards to the Helpline, they are very polite when you ring but if you have a query, they just read the pack out to you or the blog which you have already read and wouldn't be ringing if you didn't require further information. 2nd line assistance can then take up to 20 minutes to be put through to. I am an elderly farmer's wife delegated to make this application and as an amateur computer user I would appreciate either a video or written explanation of what I can expect to see on the screen, what information I have to supply and how to do it. I have no idea of the details I need to have to hand or the procedure consequently I am not confident to make a start especially as the system appears to be ammended so often. I note there has been no answer to Rachael's question above, when are we going to have a return of the service? Like many agents I have a full schedule of work to contend with on top of this with exacting deadlines. It is not been possible to "build a claim" as per your generic advice as not enough features work well enough to be confident it is time worth spending (building a claim requires multiple visits to claimants). We all have a lot of applications to submit but now we are less than two months to go with no service available and no indication as to likely return and therefore unable to plan, the level of pressure now is frankly intolerable and because of the downtime you have put huge pressure on your own computer system when it becomes live again for land. Almost as exciting as the election! I am not a confident user of the computer and fully agree with Janette's comments, when we recieved a hard copy of the handbook I thought brilliant, this will explain what I have to do step by step, but oh no just more jargon and waffle, just think about the people out there who need extra help and have not been brought up with computers, and when I eventually get myself ready to tackle it, the system is down, and you want this all done by May, why did you not get all of these issues sorrted before you sent it out to everyone, a job for the boys, which we are paying for as usual !!! Very annoyed and frustrated! I am not a confident user of the computer and fully agree with Janette's comments, when we recieved a hard copy of the handbook I thought brilliant, this will explain what I have to do step by step, but oh no just more jargon and waffle, just think about the people out there who need extra help and have not been brought up with computers, and when I eventually get myself ready to tackle it, the system is down, and you want this all done by May, why did you not get all of these issues sorted before you sent it out to everyone, Very annoyed and frustrated!